Hindu tradition and faith take precedence over women’s rights, the Constitution, the judiciary and ignoring them is inviting trouble, says Mohan Bhagwat. Even as chaos and violence continued at the gates of the Sabrimala shrine in Kerala, with groups of people preventing women from entering, manhandling journalists and damaging their vehicles, and terrorising villagers in the vicinity to shutdown their shops, far away in Nagpur, Maharashtra, RSS supremo Mohan Bhagwat on Thursday provided the justification for such brazen flouting of Supreme Court orders. Bhagwat was delivering the traditional Vijayadashmi address, an annual affair where the sarsanghchalak of the RSS provides a review of the current social, political situation for the guidance of RSS cadres. This address has become important since many RSS members are now in government, including Prime Minister Narendra Modi. The nature and premise of the tradition that has been accepted by society and continuously followed for years together were not taken into consideration. The version of heads of religious denominations and faith of crores of devotees was not taken into account. The plea by a large section of women, who follows this tradition, was not heard to. The legal verdict has given rise to unrest, turmoil and divisiveness in the society in place of peace, stability and equality. The questions such as why only the Hindu society experiences such repeated and brazen onslaughts on its symbols of faith, obviously rise in the public mind and lead to unrest. Here's what this means in plain English: if a mob raises the saffron flag and demands something, you have to accept the demand, otherwise there will be unrest and turmoil. 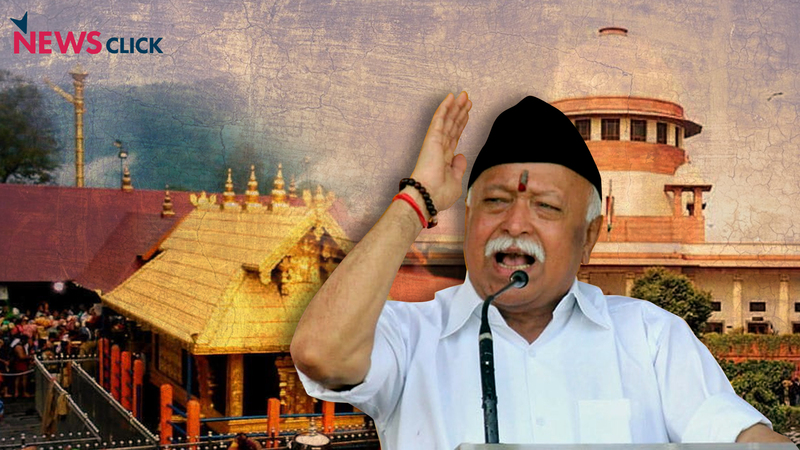 Bhagwat specifically and openly says that “the legal verdict”, that is, the SC directive in Sabrimala case, has given rise to “unrest, turmoil and divisiveness”. So, it is the Supreme Court that is responsible for the chaos and violence at Sabrimala and elsewhere in Kerala! This open call for throwing a Supreme Court decision out of the window and preventing its application may come as a surprise to those who have been taken in by RSS attempts to widen its support or acceptance through ‘outreach’ programmes of the kind held in New Delhi. In fact, faced with an agitation to allow women’s entry in Trimbakeshwar temple in Nashik, Maharashtra, in 2016, RSS general secretary Bhaiyyaji Joshi had said “Because of some unfair traditions, at certain places there has been a lack of consensus on the question of temple entry”. He had called for dialogue. But the real face of RSS – and its offspring, the BJP – as revealed in Bhagwat’s declaration, is not really surprising. After all, it has been holding this view about the Ram Janmbhoomi dispute right from the beginning. It stands for a court-initiated settlement – but only if Hindu fundamentalist groups are allowed to build a temple on the disputed site where the Babri Masjid stood till 1992. Many times, have followers of RSS and its associates declared that the courts should abide by the evidence as also the faith of Hindu people. All this is typical opportunism of the RSS and BJP. Kerala is a state where RSS/BJP has virtually insignificant support base. After many decades of struggling on the margins, BJP managed to get one Assembly seat in last elections. That too happened because in that seat, Congress and its allies pooled their votes behind the RSS nominee. So, RSS is seizing the Sabrimala issue in a bizarre attempt to increase its support among the Hindu community. This itself is a comical approach because a very large proportion of the Hindu community is in favour of opening the shrine’s gates for women of all ages. But, the RSS/BJP is so marginal that it does not even understand this ground reality. It should also be noted that the Congress, which likes to portray itself as a secular alternative to BJP, has been actively participating in the anti-Supreme Court agitation in Kerala. It thus stands shoulder to shoulder with BJP. Its all- India leaders are welcoming the SC verdict while its activists in Kerala are picketing the Sabrimala gates! Both BJP and Congress are impelled by their innate ideological opposition to the Left and Democratic Front (LDF) in Kerala. It is the LDF and its principal component, the CPI(M), that has taken a principled position of upholding women’s equality as also upholding the rule of law expressed through the Supreme Court. This stance of the Left is nothing new in Kerala or elsewhere in the country. In Kerala, the Left has a long history of fighting for temple entry of Dalits and other backward classes (OBCs). It has encouraged Dalits and Adivasis to become temple functionaries through reservation of posts for them. During the national movement, many Communist leaders like EMS Namboodirpad, AK Gopalan, EK Nayanar and others fought these battles at temple gates, on the streets and in legislatures. As Namboodirpad wrote in 1981 “…one has to abandon all ideas of paying tributes to the ‘age-old’ civilisation and culture of India. One has to realise that the rebuilding of India on modern democratic and secular lines requires an uncompromising struggle against the caste-based Hindu society and its culture”. It is this idea that has motivated pre-Independence struggles for asserting the rights of women in wearing dress covering breasts and using silver and gold ornaments, or against the tax on growing moustache by SCs and backward classes. The social reforms movement, subsequently the progressive leaders in the national movement and later the Communist movement fought against all these evils. The Left has also been in the forefront of defending communal amity in a state with sizeable populations of various minorities. It has also sought to keep alive the anti-caste efforts which have a glorious tradition in Kerala with the likes of Narayan Guru, Ayyankali, Bhattathiripad and many others fighting against the so called ‘traditions’ that Bhagwat wants to preserve. The real motivation behind RSS calisthenics on various troubling issues of caste and women’s rights, and the opportunism in propping up protests at Sabrimala is the forthcoming elections, first in several BJP-ruled states, and then the general elections in 2019. Perhaps sensing that the rhetoric used in 2014 against Congress will not work this time since it is Modi’s own misrule that will be under the scanner, RSS/BJP seem to be steadily drifting towards raking up their usual communal and casteist issues, opportunistically hoping that it will seduce Hindus to vote for them once again. However, whether it be Kerala or elsewhere in the country, they are in for a big shock: these toxic tactics will not work because people want jobs, better incomes, better farm prices, affordable education and healthcare, and equal rights. Divisive politics is not likely to get BJP or its mentor RSS anywhere.